The lithium metal anode (bottom) corrodes after just 35 cycles in the LiFSI electrolyte, while the lithium anode stays relatively stable in the LiTFSI electrolyte after more than 200 cycles. 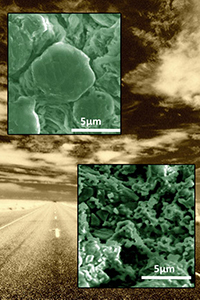 Image: Anode images courtesy of PNNL; background image courtesy of Scott Butner Enlarge Image. Ever worry that your cell phone will fade when you need it most? Or that the same thing will happen when driving your electric car? Lightweight lithium-sulfur batteries could be the answer, holding two times the energy of those on store shelves, but they often fade and won't hold a charge for long. Through the Joint Center for Energy Storage Research (JCESR), scientists at DOE's Pacific Northwest National Laboratory identified one of the reasons behind this problem. They found that salts used in the liquid in the batteries make a big difference. When a salt called LiTFSI is packed in the liquid, a test battery can hold most of its charge for more than 200 uses. The LiTFSI helps bind up lithium atoms and sulfur on the electrode but quickly releases them. In contrast, a similar liquid ties up the lithium and sulfur but doesn't release it. The result is an electrode that quickly degrades; the battery fades after a few dozen uses. Why It Matters: One of the concerns with electric cars is long, lonely stretches of highway. Drivers don't want to be stranded between charging stations, and this concern can factor into their decision to buy lower emission vehicles. The results of this study add another important page into the design guide for high-energy lithium-sulfur batteries. Methods: To determine the influence of electrolytes in lithium-sulfur batteries, the team did experiments with both LiTFSI and a similar electrolyte, called LiFSI, which has less carbon and fluoride. After continually measuring the amount of energy that the battery held and released, the team did a post-mortem analysis to study the electrodes. They did this work using instruments at DOE's EMSL, an Office of Science scientific user facility. They discovered that with the LiTFSI, the electrode's lithium atoms became bound up with sulfur. The result is lithium sulfide (LiSx) forming on the electrode's surface. With LiFSI, lithium sulfate (LiSOx) formed. By calculating the strength with which the compounds clung to the lithium, they found that the lithium sulfide easily broke apart to release the lithium. However, the lithium sulfate was hard to separate. The oxygen in the lithium sulfate was the culprit. "By conducting a macroscopic compositional analysis combined with simulations, we can see which bonds are easily broken and what will happen from there," said Dr. Ji-Guang (Jason) Zhang, who led the study at the national laboratory. "This process lets us identify the electrolytes behavior, guides us to design a better electrolyte, and improve the cycle life of lithium-sulfur batteries." What's Next? For the researchers, the next step is developing an electrolyte additive that forms a protective layer on the lithium anode's surface, protecting it from the electrolyte. Sponsor: This work was supported by the Joint Center for Energy Storage Research (JCESR), an Energy Innovation Hub funded by the U.S. Department of Energy, Office of Science, Basic Energy Sciences. In one sentence: Through the Joint Center for Energy Storage Research, scientists at Pacific Northwest National Laboratory discovered how a salt used in the electrolyte plays a critical role in allowing lithium-sulfur batteries to hold a charge after more than 200 uses; this work offers needed design principles for creating long-lasting, high-capacity batteries.